- Starting from the 1st July 2017, Expatriates have to pay yearly SR 1200/- riyals (ie,. 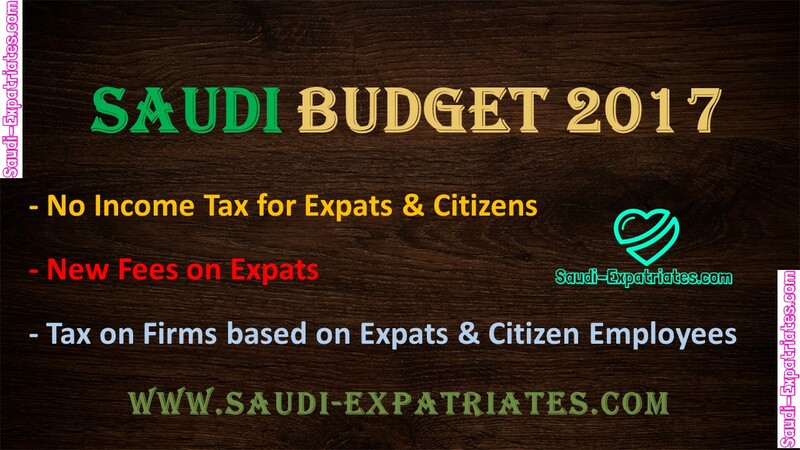 SR 100/- per month) tax on each dependent or sponsored person, The fee should be paid to the Passports Office at the time of iqama renewals. - It means, If you sponsor two persons you need to pay monthly 200 Saudi Riyals (ie,. SR 2400 per year). The estimation revenue from this fee government will get about One Billion Saudi Riyals only for the year 2017. - 200 Saudi Riyals fee per month (ie,. SR 2400 per year) on each and every expatriate dependent or sponsored person. - A monthly tax of 400 Saudi Riyals on each employee, If the company's expatriate employees are more than Saudi employees. - A tax of 300 riyals monthly on each employee of the company whose foreign employees or expatriate employees are less than Saudi employees. - A monthly fee of 300 Saudi Riyals (ie,. SR 3600 per year) for expatriates on each person or dependent they are sponsoring. - A monthly tax of 600 Saudi Riyals on each employee of the company whose foreign or expatriate employees are more than Saudi Employees. - The estimation amount of the revenue for the year 2018 is about 44 Billion Saudi Riyals. - A fee of 400 Riyals per month on each dependent person expatriate is sponsoring. - A monthly tax of 800 Saudi Arabian Riyals on each and every employee in the company whose expatriate employees are exceeding Saudi citizen employees. - A tax of 700 Saudi Arabian riyals monthly on each and every employee whose expatriate or foreign employees are less than the Saudi citizen employees.